Hiking Rocky Mountain National Park: McHenrys Notch via Flattop Mountain. McHenrys Notch via Flattop Mountain. Before I even start, just let me gush a little bit: these are the kind of days I absolutely love. A long day above treeline, stringing together a line of peaks with some technical difficulties near the end, and then a drop down to a secluded and beautiful alpine lake. It could only be made better by making the return trip past Black Lake, Jewel Lake, and Mills Lake, some of my all time favorites! With a 30% chance of thunderstorms predicted after noon, I got an early rise, and left the car at Bear Lake at 4:32. I was hoping I'd be able to move quickly while on trail, to make up for the slower movement sure to come while talus hopping. The absurdity of this all sort of struck me. I'd be doing a pretty big day to visit one thing, the notch pictured in the distance here. But there are going to be a few days like that this year. A little bit closer up. I was above treeline as the sun broke the horizon, and moving well so far. I went right past Flattop and headed for Hallett. I was on the summit for this great view exactly two hours after I left the car, and about fifty minutes after sunrise. It was pretty neat to be able to see all the peaks I'd be visiting over the day. I didn't get the camera out again until Taylor Peak. This is the third time I've been on top of it since June. Looking back to whence I came on this glorious day. I noticed that you can indeed see Lake Catherine from Taylor Peak. This is one of the most isolated lakes in the park. In a short time, I'd see another. Between Taylor and Powell, Chiefs Head on the left and Mount Alice on the right. At Powell. My speed really went downhill after Otis Peak. My hip was hurting and I wasn't able to jog. I guess I just didn't feel motivated. To McHenrys. I'd say this is one of the more difficult peaks in the park, with sustained class three climbing from the easiest route, which was on the opposite side of where I was. From the Notch, I've read 5.3. I got my helmet out, because from here on I'd be in some loose terrain. I've read a few other trip reports where it sounded like people had some trouble finding the correct gully to get to the notch. From the summit of Powell, move toward Alice. You should find the gully in just a few steps. Here's what it looks like from the top. Powell Lake at the bottom of the gully. Like Lake Catherine it is a long approach to get here. Looking back up the gully from near the top. It was solid for a short amount of time, but overall, pretty loose, though I'd say only second class. As you head down, keep an eye on the wall to your left. You have to go down a few hundred feet, but eventually you'll see a cairn. There it is. There was a fallen one out of this photo on the lower left. I rebuilt it to aid any future adventurers. Lake Powell and Mount Alice proved to be quite photogenic from this angle. Another cairn. There were some along the way, but a few places devoid of them. However, I felt the route was pretty easy to follow. You are just traversing around the rock rib to your left, and want to stay at the same elevation essentially. I thought there were a few third class moves here, but it was nowhere near the slippery, lichen covered ledge systems I've ready of others taking. But of course, you don't want to fall here! You end up spit out in the gully containing the notch itself, maybe a hundred feet or so below the notch proper. It's easy movement to the top. Looking NE from the notch. The couloir still looked packed with snow from what I could see. And once more, Lake Powell. Looking back down the notch on the SW side. Not too bad to come up. I looked at the climb up out of the notch. Imposing, yes, but I have read many trip reports from people who I think have a similar level of experience and ability. I wasn't too worried. The first fifty feet or so are solidly in third and fourth class. Then, you hit the first crux. I'd agree with 5.3, though the holds are large and there are quite a bit of them. Enough really, that you can kind of choose precisely which way you want to go. Just make sure you stay on the SW side of the ridge, as that is the path of least resistance. Past the crux, I found the lower rappel sling, and it looked in great shape. While exposed, I'd say this section was back into third and fourth class, with fairly wide ledges. You could sit down and take a break here if you wanted to. Looking up at more climbing- I think I initially spied a way up this, but ended up feeling it was too exposed and headed to the left side to find some bigger holds. The higher rappel is almost directly across here. Zoom in and look for a blue sling again. I got past the technical difficulties, and found myself on a ridge. I looked back to Powell Peak. So close, yet so far away! This is what you'll find above the notch. A pretty easy walk on talus. Well easy compared to what was just climbed. You can see this continue towards the summit. And the summit of McHenrys, what an oddity! After all that difficulty it seems like you should get to a towering pinnacle with room for one cheek at the top with bald eagles circling all around, looking at you and thinking, "Jolly good show human. You're pretty cool!". But, like on Longs, there is a fairly flat and broad summit plateau. I've read about the shock of encountering this from others, and they were right. Very close to the summit, with great views of Longs, Keyboard of the Winds, Pagoda, Chiefs Head, and The Spearhead. It's been awhile since I've visited Upper Glacier Gorge, and I've forgotten how beautiful it is. For those of you who've followed this website for a few years, you may remember July 22nd is an important date to me. This was the day in the year 2010 that a friend of mine lost a several year long battle with cancer. On or around that day every year, I get to some place amazing and remember her. This year that place was McHenrys Peak on July 25th. I wrote a message to her in the register, and said a few words before continuing down. Liberty, much love to you now and forever. The Stone Man and Chiefs Head. I had a few options from here. My first plan for the day was to continue to Chiefs Head Peak, and then descend the probably very loose Chiefs Head/Spearhead Couloir, and then climb The Spearhead, one of the last two places I have to visit in Glacier Gorge. But I wasn't able to get a clear view of the couloir from where I was during the day, and time was moving on. It was now a bit after noon, and while the weather still looked good, I felt like I was taking a risk. Thus I decided to descend into Glacier Gorge and stay high to ring around Frozen Lake and at least take a look at The Spearhead. At Frozen Lake. One time when I was here, it was actually starting to freeze. I looked to The Spearhead, and could see a party descending one of the non-technical routes to the top. I felt maybe I should still go for it, but I was also playing a game with the weather. Given the terrain and class 3-5 I would encounter on the route, I thought it might take me as long as an hour to get up and an hour to get down. That would leave me exposed above treeline for quite awhile, as I still had to find the trail and get back down toward Black Lake. A second thought was that even if there wasn't any lightning, any rain could certainly make the route much more difficult and treacherous. I lounged in some sweet smelling grass and had a snack. I really wanted to reach the top of The Spearhead, and I know some of the things that I write about on here will certainly seem risky or dangerous, but you never see the planning, training, and preparation that happens on the backside. Thus, I relied on years of experience, years of looking at the sky seeing what happens in the future. Years of observation and predicting what will happen in the next hour or two with the weather. I was disappointed to head back to the trailhead, but I am not disappointed to have to make a return trip to Glacier Gorge. The Stone Man and the very difficult looking third class side of McHenrys. In fact, I felt pretty upset. I really want to finish up RMNP this year. I am hoping to finish in early September when my parents will be visiting. Though I only have ~50 things left to go, it seems unlikely that will happen. Like I said earlier, I have a few things to visit that will take a whole day to get to for one or two destinations. Case in point- this day! I felt pretty down about this as I hiked back through Glacier Gorge. But then I looked around and remembered where I was. Longs, Keyboard of the Winds, and Pagoda Mountain. Beauty, but notice the darkening skies behind. Good decision made. Why? That's a question I ask myself sometimes. Why do I do this? There are alot of reasons, but I guess in the end most of those boil down to or add up to because it's fun and something that I really enjoy. It's the way I recharge mentally. It's a way I challenge myself physically and mentally to go farther and longer. It's a way I see god (read more on my thoughts on god here). And while I could drive to a closer trailhead to visit some of those singleton destinations, I've already planned what I think will be pretty fun and challenging days to do so. In short, it's not about checking something off a stupid list, and I lost sight of that on this day. But this view, descending to Black Lake, certainly reminded me of the true why. If I don't finish this year, it's not the end of the world. Surely not, as I'll get to spend even more time in this place that I love so much. Yes, I look forward to that last peak, and yes I would like my parents to be there. But if that doesn't happen this year, it's ok.
On that note, as of this week I will now be working a four days on/three days off schedule. I am relaxing today on one of my days off, and will have to do some errands on one of the other, but until the time they get here, I may be able to get two days a week out and about. So maybe it will happen after all. We shall see. I started seeing some people at Black Lake, and passed maybe 20 on the way down. I remember one couple in particular. When I passed, the girl sarcastically (in my mind) remarked to the guy she was with that I looked like I was dressed to do a marathon. By that time, I was getting close to mile 16, and had climbed 6 peaks and visited one alpine lake. Not *quite* a marathon, but I'd also done over a mile of vertical gain, and climbed up to 5.3! And I'm fully aware that the clothes I wear make me look like a total dork! As Dan once said to me upon viewing my coincidentally completely tan ensemble, there are no dorks in the mountains. Here's the food I ate while hiking. 1780 calories, and close to five liters of water. Plus a PB+J and chocolate soy milk on the way up, a head of romaine lettuce salad and three burritos for dinner, and ice cream for dessert when I got back home. As I thought, this was a very fun and satisfying day. It's always special to get to spend some quality time above treeline, do some fun and exposed scrambling, and visit those pristine lakes. As for McHenrys Notch to McHenrys, I'd say it breaks down into a few sections. Right out of the notch, you'll find some third to fourth class. Then the first crux, a section of 5.3. This comes to some wide ledges, which are third class, and then gets a bit more difficult again, with some fifth class moves to the top, where you find the wider third class talus ledges I took photos of above. I've seen this called about 400 feet of climbing, but it's around 500 feet of total gain from the notch to the summit. I'd suggest it's around 250 feet of actual climbing before you break out onto easier and flatter terrain. As always, I'll give the disclaimer that this is dangerous, and not a good place to learn. Just because you've done Longs doesn't mean that McHenrys via the notch is a good idea. But if you have the experience and skill, this was certainly a fun climb! I would be happy to repeat it in the future. Link to hike map and GPX file on Caltopo. Flattop Mountain, 12324 feet: 4.6 miles, 2874 foot gain. Second class. Moderate+. Hallett Peak, 12723 feet: 5.4 miles, 3263 foot gain. Second class. Moderate+. Otis Peak, 12486 feet: 6.7 miles, 3036 foot gain. Second class. Moderate+. Taylor Peak, 13153 feet: 8.5 miles, 3703 foot gain. Second class. Strenuous. Powell Peak, 13298 feet: 10.25 miles, 3753 foot gain. Second class. Strenuous. McHenrys Notch, 12820 feet: 10.5 miles, 3370 foot gain. Third class. Strenuous. McHenrys Peak, 13327 feet: 10.8 miles, 3877 foot gain. 5.3. Strenuous+. Stone Man Pass, 12500 feet: 11.2 miles, 3050 foot gain. Third class. Strenuous. 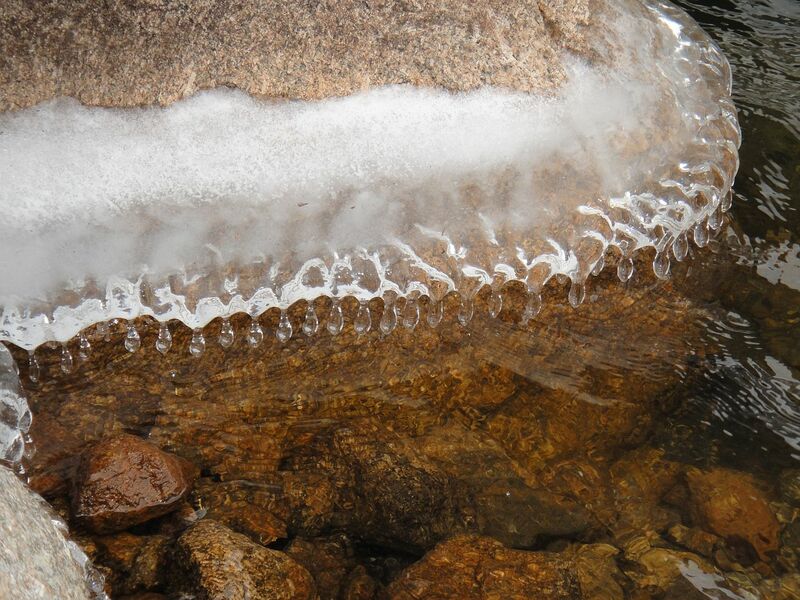 Frozen Lake, 11580 feet: 12.25 miles, 2130 foot gain. Second class. Strenuous-. Black Lake, 10620 feet: 13.6 miles, 1170 foot gain. Moderate+. Jewel Lake, 9940 feet: 15.4 miles, 490 foot gain. Moderate. Mills Lake, 9940 feet: 16 miles, 490 foot gain. Moderate. As a whole, this day covered 18.3 miles with 6460 feet of elevation gain and a maximum technical difficult of 5.3. Strenuous+.